Here is a picture I took yesterday on my way to the Common Ground Country Fair. I love border collies. They are my favorite breed. 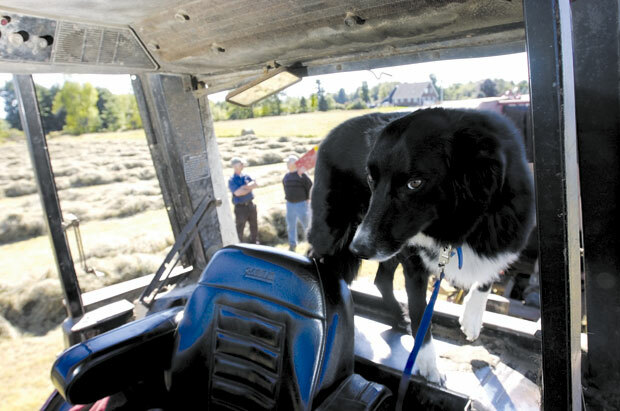 Tricia the border collie waits in the cab of her owners' tractor Friday afternoon in Fairfield. In the background Wayne and his uncle Lee Hapworth both of Winslow, wait in the hayfield for a belt to be delivered for their round bailer. Wayne said it has been difficult to put up hay this year due to too much rain. "But we should have a nice fall this year because of the rain," he said. The forecast says the next chance of rain this week will be Saturday night.